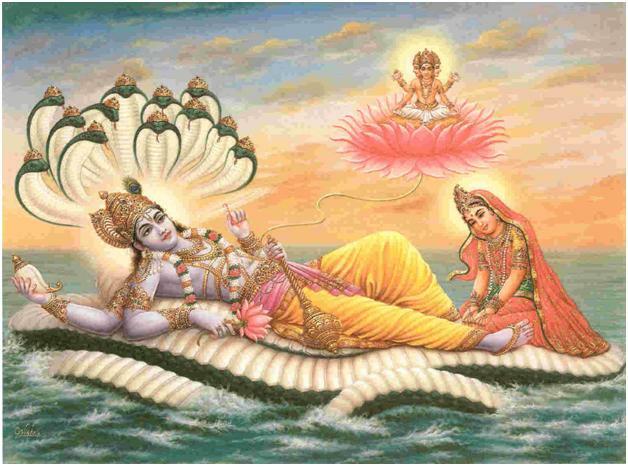 As mentioned in the part 1 of this article, Vishnu is the ultimate omnipresent reality and one of the most important Gods among the Trinity and is generally shown either in the standing position or lying on top of the snake Anantha with lakshmi, his consort serving him at his feet. Can you visualize this scene among the young couple of these days, the wife serving at the feet of her husband? May be even the middle aged or the old couples may not be doing it. What does this signify? The serpent Anantha represents thoughts, endless thoughts that pass through our minds all the time. That is why it has thousand hoods symbolising thousands and thousands of thoughts passing through our minds at any given time. In many pictures, the serpent is shown with five hoods, which represents our five senses, hearing, seeing, smelling, tasting and touching, based on which our thoughts are generated. But observe the way the serpent is lying down. It is coiled and the hoods are looking inwards, towards the God. A serpent on the move and looking for prey will not be coiled and will be looking outwards. This signifies that to achieve success and glory in life one should control all the five senses and focus inwards, towards the God, which is always within you! For Lakshmi to serve you, you have to be Vishnu, and how can one be Vishnu. 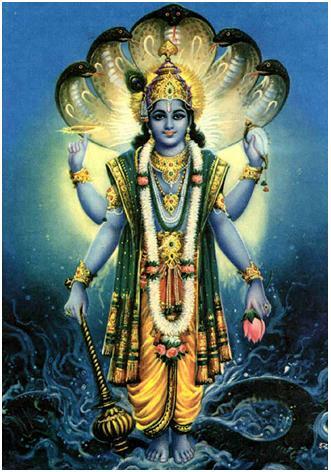 Vishnu is the protector of the universe and destroys “adharma” whenever it arises. Each of his avatars, from Fish to Kalki, is to protect the world from adharma. Vishnu is always working, never on vacation, even though he doesn’t need to do anything for himself! How about you? Do you fight against injustice, raise your voice when you see one, if not you are far from being Vishnu. Let your ideals and objectives in life be the highest, to serve the society, to serve God, then money will be at your disposal! According to various Puranas, Vishnu is the ultimate omnipresent reality and one of the most important Gods among the Trinity. He is generally shown either in the standing position or lying on top of the snake Anantha with Lakshmi, his consort serving him at his feet. Let us try to understand the symbolism behind his various forms and how we can benefit from having better understanding of the symbolism. 1. The name Vishnu means all pervading, omnipresent, etc. 2. He is shown with four arms. 3. The colour of his skin is blue: The blue colour indicates his all-pervasive nature, blue being the colour of the infinite space as well as the infinite ocean on which he resides. 4. He has the mark of sage Bhrigu‘s feet on his chest. 5. Also on his chest is the srivatsa mark, symbolising his consort Lakshmi. 7. A crown adorns his head symbolizing his supreme authority. 8. His four hands hold a conch shell or Shankha named “Panchajanya”, the chakra, a sharp-spinning discus-like weapon, named “Sudarshana”, a mace or Gada, named “Kaumodaki”, and a lotus flower or Padma. Now let us try to understand the significance of Vishnu symbolism. 1. Vishnu, the name and the colour signifies all pervading and omnipresent. If you are the CEO or a manager of a company, your presence have to felt across the organization to be effective, irrespective of the fact that your men are working across geographies in different offices and departments. If you are in sales or marketing, your customers must feel yours and your company’s presence all the time and this can be achieved either by smart marketing or by physically covering the market. Only then you and your company can be successful. 2. Have you ever recited this prayer “Karaagre Vasate Lakshmi, Karamuule Saraswati, Karamadhye sthithe Gowri, Prabhaate Kara Darshanam”? This means the front part of the hands (the fingertips) is ascribed to Goddess Lakshmi, the Goddess of Wealth, the middle part (the palm proper) to Goddess Saraswati, the Goddess of Learning, and the root (the part of hand near the wrist) to Gowri (the Goddess of power). This prayer is to be recited first thing in the morning once you get up and essentially means that only if you work hard you can attain knowledge, wealth and power. Or everything is in your hands. Generally we all work with one hand. The four hands of Vishnu depicts that you have to work much more than an average person to be extremely successful. 3. The conch shell in his hand is called “Panchajanyam”. It has two meanings. The sound from the conch is “Om” and as the first sound (pranavam) is the origin of the entire universe. It also means that which produces the five elements, ether (space), air, fire, water and earth, from which the entire universe is created. You have to produce results to be successful. 4. The disc or chakra is called “Sudarshana” and we think that it is the ultimate weapon used by Vishnu or Krishna to kill the enemies. But the fact is different. Sudarshana means “auspicious vision”. How can you kill a person with auspicious vision? This essentially means that you convert a person who is defocused and not doing what is expected to be done. It could also be someone with negative character doing all the wrong things. By proper advice and guidance you can convert any person to think and behave the way what is appropriate to the society or the circumstances. Once you do that the bad element in that person is killed and goodness is born. That is what Krishna has done with Arjuna. Krishna converted a dejected and de-motivated Arjuna to take up arms and start the war as that was his solemn duty as a Kshatriya in the battle field. Every organization has a vision statement which we all are supposed to follow with total devotion and commitment and do whatever it takes to live the vision and convert every other employee to be committed as well. 5. Vishnu has a crown in his head and mace in his hand and that represents his authority and power. The crown represents his positional authority, generally worn by kings and the mace represents his authority to punish people when they go wrong. In organizations positional authority is depicted by their title (that is why everyone wants a manager’s title). Managers also have the power to reward and punish those who are his direct reports. 6. Lotus flower which Vishnu holds in one of his hands is one of the most popular symbols in Hindu and Buddhist religion and represents purity and non attachment. It grows in mud and lives in water, yet is one of the most beautiful flowers and never gets wet. It is not bothered about the surroundings but blooms and performs its job before vanishing. The ultimate aim of living beings is to perform its karma without bothering about the external factors. Generally we are bothered about everyone else in our job or surroundings and keep complaining about them without focusing on what we are supposed to do. People say that one’s character is defined by his nature and nurture, means the family and environment. What lotus teaches us is that irrespective of our family background and our upbringing, we can lead a life of perfection and attain great achievements if we live like a lotus. 7. On his chest Vishnu has the “srivatsa” mark symbolizing his consort Lakshmi. Does this mean that you have to keep the photo of your wife in your shirt pocket all the time? Or like the fad these days make a tattoo of your wife on your chest? Certainly not. For me this signifies that you should always be thinking and caring about your family, including spouse, even when you are immersed in your professional or personal pursuits. Therefore let us all try to live the life of Vishnu and be highly successful. Most of us visit places of worship (temples, churches, mosques, etc) to pray to God to solve our problems or grand us a boon to fulfil our wishes. But does that work always? What do our scriptures teach us? The Bhagavata (also known as Śrīmad Bhāgavatam) is one of the “Maha” Puranic texts of Hindu literature, with its primary focus on bhakti (devotion) to the incarnations of Vishnu, particularly Krishna. It is also known as the fifth Veda and the authorship is credited to Sage Veda Vyasa. This story was told to Maharaja Parikshit by Sri Suka Brahmarishi, in seven days while Parikshit was waiting for his death due to the curse of Sage Sringin, son of Sage Samika. Maharaja Parikshit was the grandson of Arjuna and grand nephew of Lord Krishna. He had the great fortune of seeing the God while in the womb of his mother Uttara, as Krishna saved him from sure death by the unstoppable Brahmastra shot by Ashwathama at the end of Kurukshetra war. Later on he ruled the kingdom for many years and was considered to be one of the best kings, comparable to King Rama or Ikshaku of the previous yugas. Though Parikshit was so great, due to the effect of Kali (a demon), unfortunately did a mistake — for which the punishment was death! Once after a hunting expedition, tired and very thirsty, Parikshit reaches the ashram of the great Sage Samika. The sage at that time was in deep meditation and completely detached from the environment. Hence, he did not notice the exhausted King Parikshit and his request for water. Thinking that the sage is intentionally ignoring and insulting him, the king became angry and puts a dead snake around the neck of Samika and leaves the place. Shringin, the son of Samika, realizing that Parikshit did such an insult to his father, curses Parikshit that in seven days he will die of snake bite. Having known about the curse, what Raja Parikshit did was to prepare him for the death and did not try to escape from it. Even though Parikshit has seen God even before birth and has been guided through out by His presence, he only asked for guidance to face the problem, and not help him live longer by neutralizing the effect of the curse. When great sages like Vyasa and Suka visited him, his request to them was to teach him how to overcome fear and focus his mind on to God and prepare him for Moksha. Most of us are not as blessed as Raja Parikshit, seeing God in dreams also is very rare. Yet we ask God to solve our problem! Please understand that we have to accept our “Karmaphala” (results of our deeds) based on our Karma (deeds). We should only ask God to help us face the problem; give us the strength, courage and ability to face the problem. Similar things happen in many organizations too! Employees expect the management to do everything to ensure, guarantee their success. If one is in Sales or Marketing, the expectation is that the company must have the best products in its category, price should be the lowest and to be sold with a promise of lifelong free support! We all expect to be paid better than the best company, excellent offices and other infrastructure, working hours limited to 9 to 5 for five days a week and no pressure to perform as it will impact work life balance! Great! What one should expect from the organization is training and education and support to produce excellent results with whatever products are available with the company. The company can prepare us to face the challenges of the market place, but it is the employee who should go out and meet the challenges to be successful. Of course comparable salaries and good work environments are essential but expecting beyond that is like expecting the God to solve all our problems! Attitude of Gratitude and Guru’s blessings are essential for Success. A grateful heart is the beginning of greatness. Gratitude builds humility as we recognize an act of kindness, service, or caring from someone else. True gratitude is a foundation for faith, courage, contentment, happiness, love, and well-being. Being grateful leads us to look outside ourselves and turn to the bestower of the blessings. The link between spirituality and gratitude has recently become a popular subject of study. While these two characteristics are certainly not dependant on each other, studies have found that spirituality is capable of enhancing a person’s ability to be grateful and therefore, those who regularly attend religious services or engage in religious activities are more likely to have a greater sense of gratitude in all areas of life. Guru-kripa-grace of a Guru-is also an essential element for one’s success. A Guru can be pleased with his disciple only if the latter carries out his instructions diligently and implicitly and do nothing that will hurt the feelings or image of the Guru, Guide or the teacher. However what do we see around us these days, particularly in the corporate sector? They act like Bhasmasura, trying to destroy the very person or organization that has helped the individual to be where s/he is today. Demon Bhasmasura performed intense ‘tapas’ (penance) for several years with only the thought of Lord Shiva. Finally, Lord Shiva relented and granted the demon the boon that he asked – that he could burn to ashes anyone whose head he placed his hand. An Asura, Bhasmasura showed his true color and he wanted to test the power of the boon by placing his hand on Shiva’s head. Shiva fled in terror and sought the help of Lord Vishnu. Lord Vishnu who knew about this evil desire took the form of Mohini, the seductress, once again. Bhasmasura is taken with Mohini’s charm and beauty and asks her to marry him. Mohini convinces him to dance and mimic every move that she makes. In the course of gestures and postures, Mohini puts her hand on her head and Bhasmasura, distracted by her beauty and grace, does the same. The moment he places his hand on his head, he gets burned and dies and Shiva and the world are saved. Don’t we see many Bhasmasuras around us in the corporate circle? A company invests more than six months of their time, money and resources in training the person, in their technology, products, markets, competitors and also imparting the necessary skills such as selling techniques, diagnostic skills, communication skills, leadership skills, etc. In high technology companies, the training is ongoing both in the class rooms as well as on the job. Once that person starts getting results and being successful, may be after 3 or 5 years, s/he feels de-motivated due to increase in expectations. And then leaves the company and joins the competition. There he uses all the knowledge and skill learned earlier, to destroy the same company that made him eligible for the current job by misusing trade secrets and internal information and saying negative things about the products and people. He will also try to allure people and make the company weak. I am not against persons joining competition, but should believe in the law of abundance; my success is not achieved by the failure of someone else, there is enough in the world for all of us to be successful. When one is reasonably successful in life or in any particular endeavor they generally attribute it to their individual knowledge, competence and hard work. Probably that would also be the beginning of their decline. However great one may be no success can ever be achieved without the support from many persons who are known and unknown. And Gurukripa is essential for continued success! 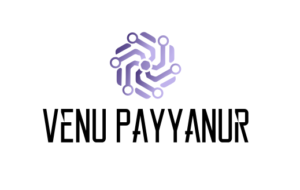 https://venupayyanur.com/wp-content/uploads/2019/01/Venu-Payyanur-300x190.png 0 0 Venu Payyanur https://venupayyanur.com/wp-content/uploads/2019/01/Venu-Payyanur-300x190.png Venu Payyanur2010-11-03 03:49:512019-01-05 10:43:07Attitude of Gratitude and Guru’s blessings are essential for Success. Hindu Gods and Women Empowerment. “Behind Every Successful man, there is a woman”. I do not know who said this and when, but the guess is sometime during the mid 1960’s when the woman’s liberation movement was at its peak. The current generation may or may not agree with this as is visible from the blogs and debates going on in the internet and other forums. Some of the statements could be quite demeaning to women such as “Behind every successful man, there is a woman, and behind her is his wife”. However, if you study the Hindu scriptures, written 5000 or more years ago, one can see the importance given to woman in our society. Let us start from the Trinity, the Gods of Brahma, Vishnu and Siva. Brahma is the creator and to create anything one must have Knowledge. Nothing can be created without having the knowledge about what, how and when to create. Therefore his spouse is the Goddess of Knowledge “Saraswati”. Vishnu is the God of protection or sustenance and one must have wealth to maintain such a large universe with diverse population of man, animals and plants. His spouse is the Goddess of wealth. Siva is the god of destruction, rather constructive destruction, as you cannot create anything new, either physically or mentally unless existing ones are destroyed. You need power to destroy and therefore his spouse is Shakthi, the goddess of power. Vigneswara or popularly known as Ganesha, the elephant faced God is the god of Obstacles. One must pray to Him before any auspicious work is started so that all obstacles are removed with his blessings. His wives are Buddhi (Intelligence) and Siddhi (special skill) which are essential for all of us to remove any obstacles in our lives or to be successful in our profession. There are more such examples in Hindu mythology which all leads to the conclusion that indeed there is a woman behind every successful man or the corollary being one must have a supporting, caring and intelligent wife to be successful in our lives. https://venupayyanur.com/wp-content/uploads/2019/01/Venu-Payyanur-300x190.png 0 0 Venu Payyanur https://venupayyanur.com/wp-content/uploads/2019/01/Venu-Payyanur-300x190.png Venu Payyanur2010-11-02 19:31:412019-01-05 10:43:07Hindu Gods and Women Empowerment. As an avid reader of Indian spiritual texts and scriptures and a practicing manager for more than 25 years, I have learnt many useful tips that one can use from Indian spirituality in our day to day life and management practices. I intend to write about those and publish in these columns. I hope you all will find it useful and support me with constructive criticisms and positive feedback.